Mr. Walford affords the reader great insight with regard to one of the most highly influential fashion decades of the past century. The 1940s continue to influence contemporary fashion designers as well as so many who came before them after this era. The story starts out with a couple of very amusing anecdotes telling of the “fashion” concerns of the wives of two of the most notorious villains of all times: Goebbels and Goring. It seems that these women were highly concerned about their appearances and wardrobes, impulses that were quite contrary to the policies that were being promoted by their murderous husbands. The amusement is short lived as there are precious few of these types of “stories” going forward as the timbre of the book becomes decidedly historical and textbook-like. By no means is this book a waste of time for anyone who is hungry for knowledge as to the whys and wherefores of this particular era. Mr. Walford deftly tackles the pre and post wartime mood via illustrations and advertisements of the times, not to mention the physical history of life during this period. He provides us with details of rationing, the shortages of raw materials, the introduction of synthetics, as well as the reasons behind the design philosophies of some of the greatest and notable designers of all time. To his credit, Mr. Walford does not depend only on the well known, but mainly stays on the outer limits of fashion by speaking of the “behind the scenes” entities of fashion such as textile mills, retailers, and even the notions trade. If “notions” is not a term you know, then you best get a good dictionary. This is certainly a scholarly undertaking that educates not only the novice fashion fan but also the well seasoned and is the reason why it is a worthwhile read. 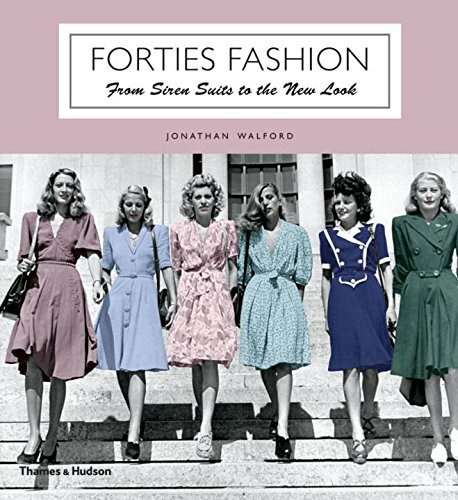 It is a pity that Mr. Walford was unable to include a few more of the anecdotes that he used in the beginning of the book as Forties Fashion: From Siren Suits to the New Look becomes a bit more of an analysis and history as opposed to a lighthearted designer’s tale of that period. The author nonetheless provides plenty of information that has rarely been brought to light in books about fashion.